The 7-a-side CP team were in Paralympic action on Saturday night. IRELAND WERE ON the receiving end of another heavy defeat this evening, shipping seven goals in a demolition at the hands of hosts Brazil. Three days after a 6-0 defeat to Ukraine in their opening game, Barry Ferguson’s side were run ragged once again in front of a sell-out crowd of 7,000 at Deodoro Stadium; the consolation at least on this occasion being Dillon Sheridan’s fine second-half strike. The gulf in class was always going to be too much to bridge and once Brazil broke the deadlock after just five minutes, the end result was a mere formality. Ireland showed more tenacity and enterprise tonight but rarely gave the home side — backed by a partisan following — anything to worry about in what turned into a one-side encounter. If it had have been a schoolyard game, Ireland would have been given a player, or two, to try and even up the teams. Even still, Brazil were a cut above and enjoyed complete dominance throughout as they followed up their 2-1 win over Great Britain with a far more straightforward one here. 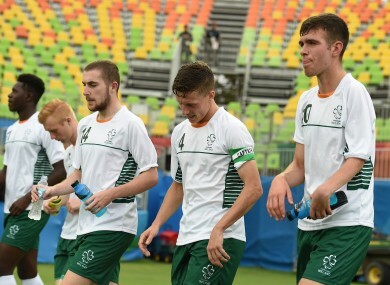 Ireland can, however, take heart from the improved performance and now go into Monday’s clash against GB hoping to salvage something from this Paralympic campaign. Sheridan’s goal was undoubtedly the highlight, with the striker showing good strength and footwork to turn his man and apply a low finish past the goalkeeper, who had just been brought on as a replacement. He was tested a couple of times towards the end of proceedings but by then the contest was well over and Ireland well beaten. Email “Ireland no match for rampant hosts as Brazil run riot in Rio ”. Feedback on “Ireland no match for rampant hosts as Brazil run riot in Rio ”.